The interior shots in Blade Runner where filmed in the Frank Lloyd Wright designed Ennis House. The house, which is broadly based on Mayan themes, is one of Frank Lloyd Wright's Textile Block houses. Like the other Textile Block houses, Ennis house is constructed from thousands of precast interlocking concrete blocks, each with a patterned unique to the project. Ennis House has been used as filming location countless times, but is most recognized for the original Blade Runner. Its unique precast textile blocks are a visible throughout the films interiors scenes. The Neo-Mayan design of the blocks mixed with the film's moody lighting firmly establishes the films interiors in unsettlingly alien future. Detailed drawings of the Ennis House Blocks are available, but I decided to start from a pre-existing 3D model. Thingiverse User Keenan has created a 3D model of one of the texture block faces. He has made it available for download and modification under the Creative Commons License, so I can download it for my own modification and use. With the Keenan's original SketchUp file imported into Fusion 360, I converted it from a Mesh into a BRep. This make the 3D model much easier to edit. To do this successfully, you'll need to be in the 'Model' workspace with design history disabled. (It should already be disable when you opened the imported SketchUp File) Left click the MeshBody in the Navigator menu and select the 'Mesh to B-REP' tool. To make a mold for the concrete block, I needed to inverse the surface of the block into the wall of the mold. Easy to do using Fusion's 'Combine' Tool. The Mold will make a cube, with every side textured. So with each of the six sides being identical, I only need to draw one side! Computers are great for being lazy! The Tool Path for this file is straightforward. First we'll mill all of the horizontal faces with a 3mm flat endmill, then we mill the walls and mold edges with a 3mm ball endmill. I used Fusion 360's CAM Pattern tool to duplicate the G-Code 6 times in the machine's Y axis, so all 6 mold faces can be milled at once from a single 18mm thick pine board. Be sure to check the 'order by tool' option box, so the machine will run all of the operations on all of the tiles that use the same bit before stopping for a tool change. CNC Cutting time for all six mold faces was approximately 2 hours. Straight out of the CNC Machine, the pine molds are going to need some smoothing before we can cast them in concrete. I could spend hours painstakingly sanding them, but this is intended as one time use mold so I don't want to invest that much time in it. So after a quick sanding to remove the big stuff, I resorted to and old method to get rid of the small fibrous left overs... FIRE! 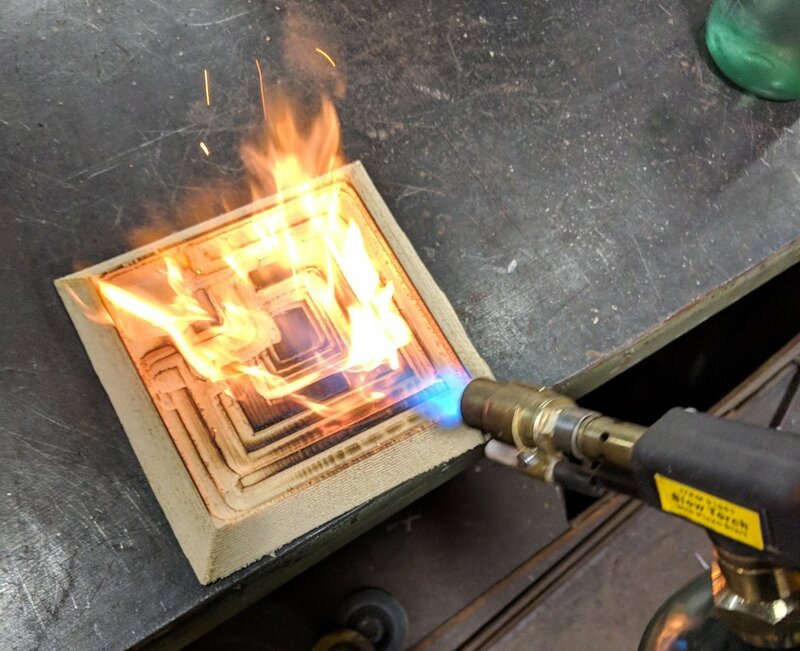 The blow touch flame burns away the rough areas, and leave a smoother surface behind. Just be sure to have a spray bottle of water handy to stop the flames if the get out of control! I mixed the concrete fairly wet, so it would flow easily into the mold. There is no way around the how messy this process is. I used a Hammer to bang on the sides of the mold after poring, to drive the air bubbles out and make the final block uniform in color and texture. After Curing overnight, It was time to see our final Blade Runner Block. Opening this mold required a hammer, chisel, and crowbar. After 24 hour in contact with wet concrete, the soft Pine had become wet and soggy, there was no saving it. Now that is awesome! The charred surface of the pine stuck to the concrete in a few places, and there are a few minor bubbles, but overall its an excellent result for a one day project. The rough texture of the concrete came through in a few places, just adding to the block's appearance as an aged relic. Where I doing this project a second time, there are a few thing I would change. Most are related to the casting process. I would use 'Topping Mix' instead of the Portland Cement I used in this cast. Topping mix will more easily fill the mold and is intended to be mixed wetter without degrading. I would pre-coat the inside of the mold with a combination of water and a surfactant like 'Jet Dry' before pouring the concrete. The surfactant would help element some of the smaller air bubbles. 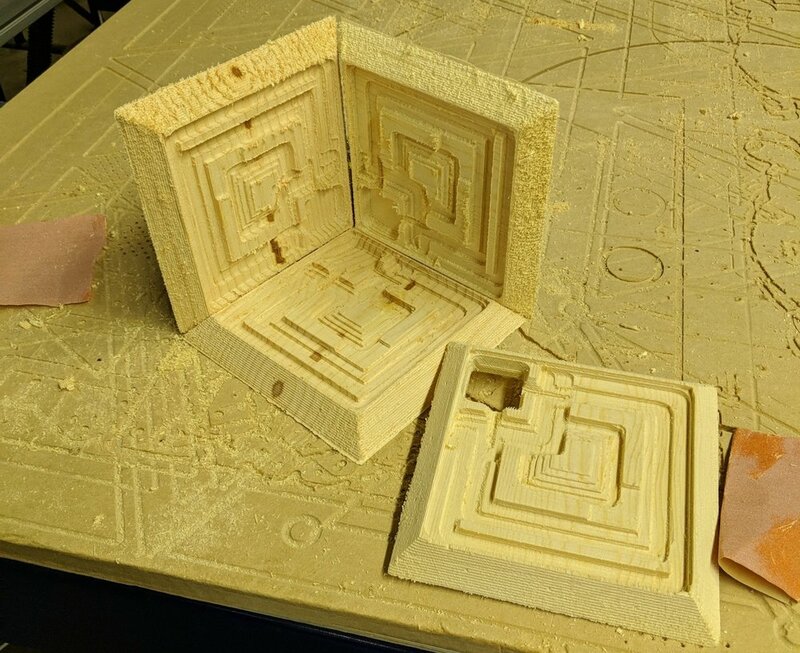 I would redesign the mold with an internal cavity on one side instead of making it a sold cube. That way it could be used as a flower pot... At this point the only use I can find for this 8kg block of concrete is as a really awesome doorstop! Thanks for reading! I hope you are making something awesome! While enjoying a Sunday morning at the coffee shop a few weeks ago, I found myself daydreaming about a concept for a small easy to build Parametric CNC chair. I've been playing with Fusion 360's Parameters section for awhile, and this is the perfect project for a parameter driven design! A Parametric Design is driven not by fixed values, but but variables and mathematic relationships. It gives you the ability to quickly change elements of a design without needing to redraw it completely. Need a child sized chair? No problem, set the seat hight lower and make the seat smaller! Need a seat for NFL Linebacker? Better raise the seat height and use thicker material for all the parts! Download and Build Your Own! If you'd like to download this project, you can follow along to see how the file is put together! 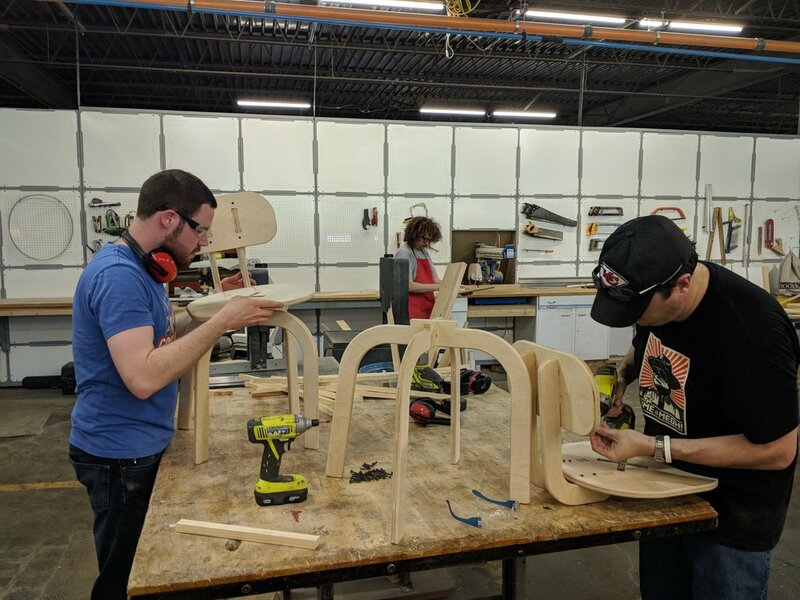 If you have access to a CNC Machine, you can even use this file to make your own chairs! For the file to work properly, you will need to download it as a 'Fusion 360 Archive' and re-upload it into your own Fusion 360 account. If you download this, aggressively market it and make untold millions from my design, all I ask is that you donate some of the proceeds to charity... and buy me a large yacht. The design of this chair is driven by seven input values. Bit Radius - This is the diameter of the CNC bit that will be used to cut out the parts, this is used to drive the dog bones that make assembly easier. Allowance - This is a general value added to the width of slots where one part needs to slide into another one. If we cut out a chair and find the part are just slightly two tight or loose, we can fix that by tweaking this value. In a parametric design sizes and relationships between elements are not driven by fixed dimensions, but by mathematic relationships based on the input parameters. Each of the dimension values read something like fx: 7.50 or fx: 2.50. The fx: prefix before a dimension denotes that it is a computed value, not a fixed value. If I open one of these Dimensions we can see whats going on. The value of this radius on the upper corner of the seat back, which shows in the sketch as fx: 2.50, is dimensioned as Width/6. So Fusion looks up the value of 'Width' from our parameters, divides that value by 6 and make the result the radius of the arc. 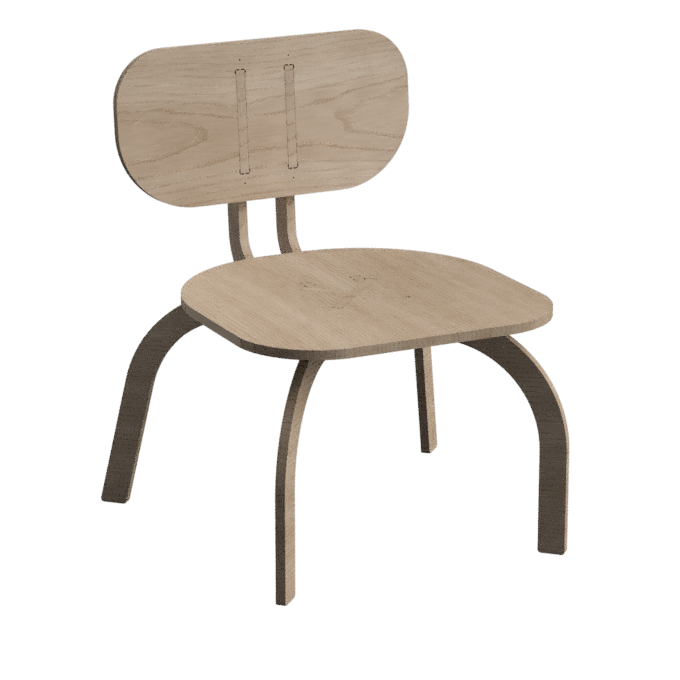 Most of the dimensions in this chair are driven this way, with the exceptoin of the screw holes, which are all a fixed diamiter. 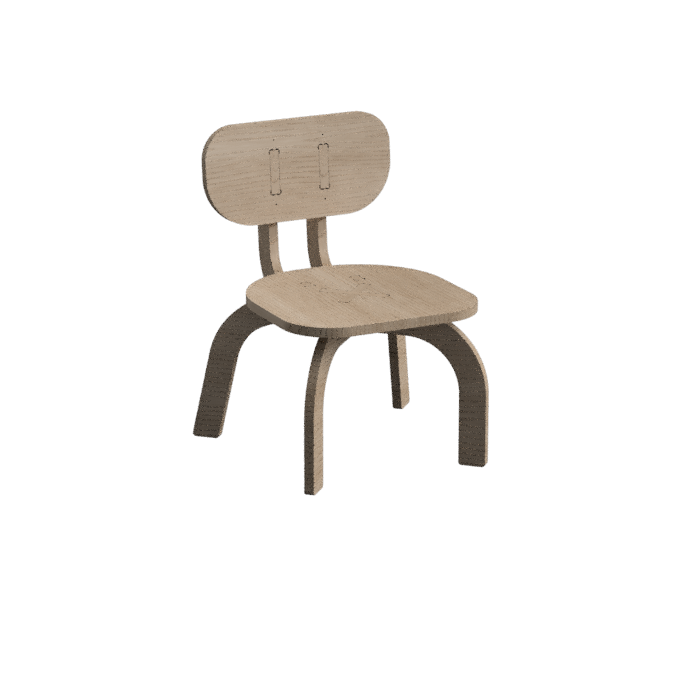 Now lets make a version of the chair for those short wiggly kindergarteners! We'll lower the seat height from 18 inches to 12 inches, and the back height from 32 inches to 24 inches. Next lets make a wide version, for when the in-laws come to visit! With our chair sized, copy all of the chair's bodies into a new empty component. The duplicate parts will maintain there relationship to the original parametric bodies, but we can use Fusion's 'Align' and 'Move' Tools to lay them out onto a flat sheet and cut them out on our CNC! 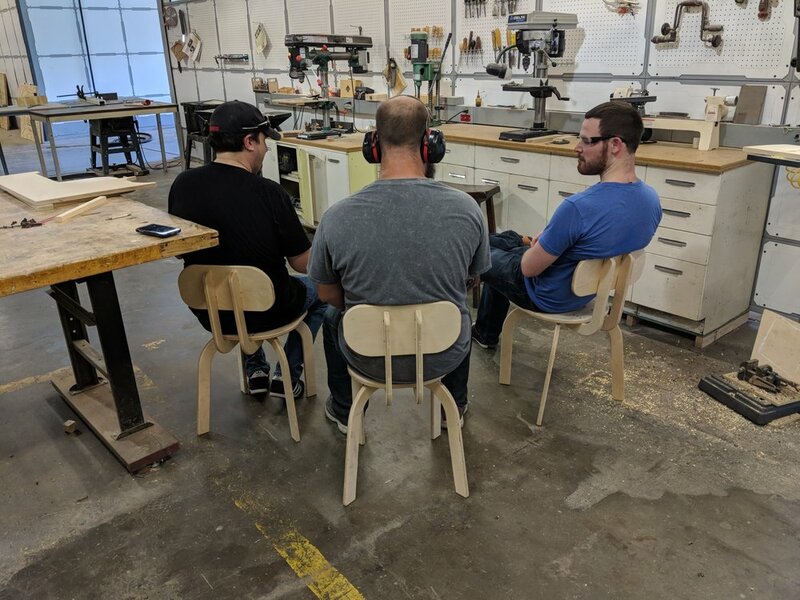 We ended up building these chairs is an 'Introduction to Fusion 360 CAM' Class we teach here at Hammerspace Workshop. 18mm Baltic Birch plywood we used is amazing stuff. Well made, dimensionally accurate, and fantastically strong! None of these class participants were small guys, and all the chairs came together awesome and strong! Thanks for Reading! I hope you are building something Awesome! Over the last few months, I've been working to rebuild a ShopBot Alpha CNC machine that Hammerspace Workshop received as a donation. The machine was only a frame when we received it, so its been a long road to collect all the parts needed to get it running again. In rebuilding this machine I've had an eye towards experimenting large scale 3D milling operations. The ShopBot Phoenix is much lighter then our other CNC machine at Hammerspace, letting it run at feed rates 3 to 4 times faster, but can't take as deep of a cut per pass. With everything finally assembled, and some small test jobs under my belt, It was time to try something more ambitious! My father restores Little British Sports Cars as a high level hobbyist. He tracks down hard-luck cars in need of heavy mechanical work, gets them back into working order, then sells them on to other enthusiast looking for mechanically solid project cars. Its not really a business, more of a personal mission to save cars from being parted out and sold on Ebay. A hobby that cool requires an awesome sign! So I decided to use my newly resurrected ShopBot 'Phenix' to 3D carve one for him as a Fathers Day Gift. 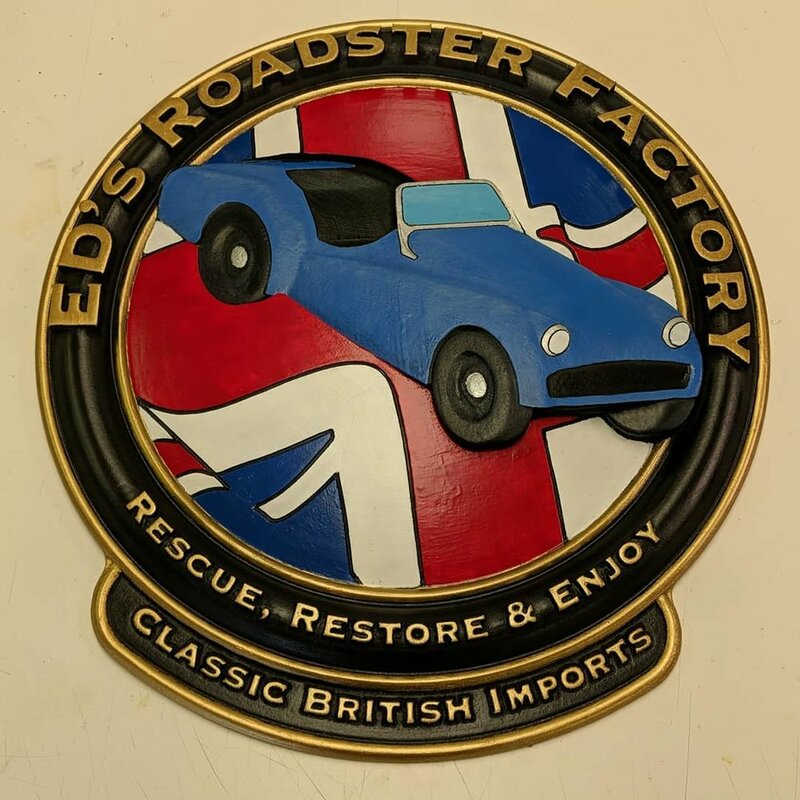 The sign was designed in Fusion 360, which has become my CAD platform of choice in recent months. Fusion 360 integrate CAD and CAM tools into a single piece of software, making projects like this one much more approachable. The 3D model needed to respect a few basic principles. No Undercuts! The ShobBot Phoenix is a 3 axis machine so it can only carve straight down in the Z axis. 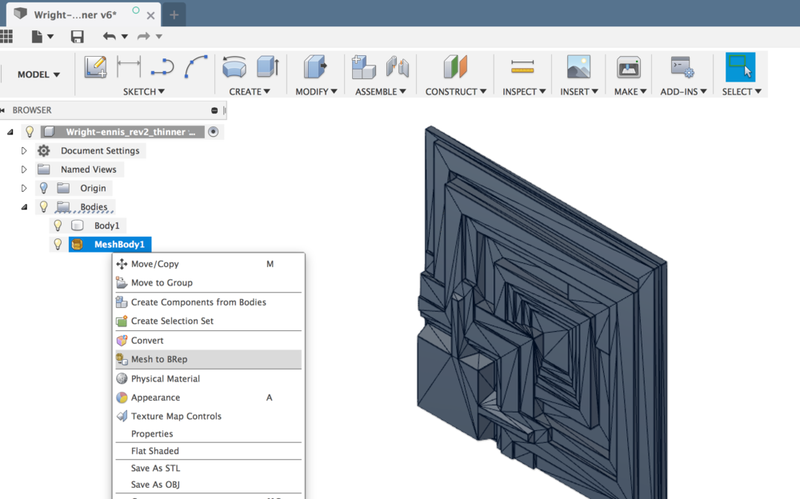 The 3D milling Toolpaths in Fusion 360 where divided into 6 operations using 4 different tools. We'll look into each of them individualy here. The goal of this pass was to cut away the majority of the the material to be removed, and provide space for the tool/collet/spindle body to access the lower levels of the part in subsequent operations. For this Operation, I used a Pocket milling path with the spindle running at 12k RPM, a cutting feedrate of 210 Inches Per Minute (IPM), and a stepdown of 1/2 inch. The 'Stock to Leave' is set to 0.1 of an inch, leaving enough material behind for subsequent passes. The bottom height of this path is set to 1 inch above the bottom of the model, so this path dosen't get bogged down in any of the more detailed areas that can be handled without pre-clearing. The 1/4" ball endmill is almost 3" long, giving it the ability to access much deeper into the block then the 3mm endmill that will be use for the final detail paths. To provide access for these later tools, I set the machining boundary to 'Silhouette' with the tool on the outside, and added and additional offset of 1.25"
Cutting this path took about an hour and a half. I think the machine could have handled a higher feed rate. Next time I'll try something in the 250 ipm to 275 ipm range. Using the same endmill as the first path, this second path refines the shape of the sign down to 0.05 inch from the final surface, clearing most of the remaining spoil material. For this path, I used a Spiral milling path, will machining boundary to 'Silhouette' with the tool on the outside, and and additional offset of .05 inch. This path took about 30 minutes to carve at 210 ipm. To carve the final detail on the sign, I switched to using 3mm endmills. This first finishing pass is with a flat 3mm endmill, to smooth the tops of the leters and other areas. An important note: I have found that most of the inexpensive end mills sold as being 1/8 inch are really 3mm. Its always good practice to verify specifications before using any tooling. 3mm is a far more common available size globally than 1/8 inch making it much less expensive. I speculate we'll soon see the same thing start happing with 1/4 inch and 6mm tooling. The path was generated as a Horizontal milling path with the spindle set to 10k RPM and traveling at 120 ipm. This path took less then 15 minutes to complete. The Final 3D contour pass carved the majority of the sign's final surface. This path was a 3D Contour pass with only basic modifications. The speed was set to 120 ipm, the RPM to 10k, and the bottom of the pass was offset from the bottom of the model by 0.4 inch. This offset keeps the sign firmly attached to the rest of the mass of the blank, and is designed into the model as a straight 1/2" vertical depth all the way around the model. This path took more than 5 hours to carve. Honestly, I should have run the machine much faster then 120 IPM, but those little end mills are so easy to break that i've become a little paranoid. Rather then model the elements of the billowing UK flag into 3D, I used a really neet milling trick Fusion 360 can do called 'Project'. A project operation takes a flat line from a sketch, and mills it into a selected surface by a specified depth. This path took less then a minute to cut, as was so much easier then trying to build all of that contour into the 3D model. This final path was a 2D contour used to cut the sign free from the remains of the original block. I used tabs, but they were likely unnecessary. This path only took a minute or so, and was followed by sanding... lots of sanding. Painting the sign was a fun and fairly straightforward task. After an initial sanding, I sprayed the sign black to seal the surface before sanding again. A final coat of black formed the base of the color. The areas that are going to receive bright colors where brushed in with a base coat of white acrylic. The remainder of the color was brushed in with thick body acrylics, then a sealing coat of clear was applied. Finaly, high quality metal effect paint was used to paint the boarder and raised letters. This paint must go on after the clear to keep its shine and pearlescent effect. I wouldn't use MDF again. I had been advised this before hand, but it was the material I had on hand, and this was a non-revenue project. The final surface of the MDF really left a lot to be desired. Even repeated cycles of sanding and sealing couldn't fully smooth the final surface. In the future, I'm going to look at different types of wood, or possibly a machinable foam board products for doing this type of work. One idea i've had is to build up the blank from multiple layers of different woods, then carve down to each layer to create a multicolored 3D object. I will also push the machine to run faster in the future. I honeslty think in soft material and a 1/4 inch bit, this machine will happily run at more then 250 IPM. A student in one of my recent Mini Nuke classes asked if I knew how to build a folded paper Halo ODST Helmet. I'd never done Pepakura before, and decided to give it a shot! All told, assembly took me about 4 hours. I highly recommend getting the parts laser cut. Having the guys at Hammerspace cut these for me cost less the $15 and saved days of work. Check out their Digital Fabrication Services if you need something cut on the laser. A few quick tips withe process of Assembling a Pepakura Model. Work with the model open in Pepakura Designer. The logic of the parts is non-intuitive and selecting a face in the model will highlight the part you need on the layout. Your hands will get covered in Super Glue. There is no way around it. When you're done working, or you fingers get too curtsy to proceed, use an Acetone soaked rag to clean your hands. The Acetone will break down the cyanoacrylate and make it easier to remove with soap and water. If I were to proceed with this model, the next step is to coat it in Fiberglass resin, which will harden it, then begin using bondo to smooth out the facets. I'm not committed to that part of the process, so I will likely just leave this in its current form as a display piece to illustrate the Pepakura process in the Hammerspace collection. This file came from the 405th Pepakura Database. You'll need to create a login with them to view/download them. It's been forever since I posted new projects here, but that dosn't mean I've stopped building them! I'm going to be working to publish my backlog of old projects, but for now we have a favorite from a few years ago, My Raspberry Pi Toaster! I have been experimenting with making fiberglass parts for my upcoming Kansas City Maker Faire Project. To help others who are intrested, I made this short video documenting my process. In recent weeks I've become more interested in milling three dimensional molds Using Fusion 360. At Hammerspace I have access to two 3 axis mills, my personal 1 meter square Inventables X-Carve, and a 8 foot by 10 foot frankenstein of a machine that I've taken to calling 'The Beast'. 'The Beast' in action at Hammerspace. This CNC is so big and heavy, they had to build an extension to the workshop around it. The Beast had a cutting area of approximately 10 feet x 8 feet x 2.5 inches deep. It is really more of what is called a 2.5D CNC machine, intended for cutting slots and tabs in sheet material like plywood and aluminum. This machine had been lobotomized and rebuilt around a Mach3 controller, so it is capable running G-Code directly from Fusion 360. I'm going to use The Beast for some of my experiments, but to mill anything more then 2.5" tall, I'll need a different tool. 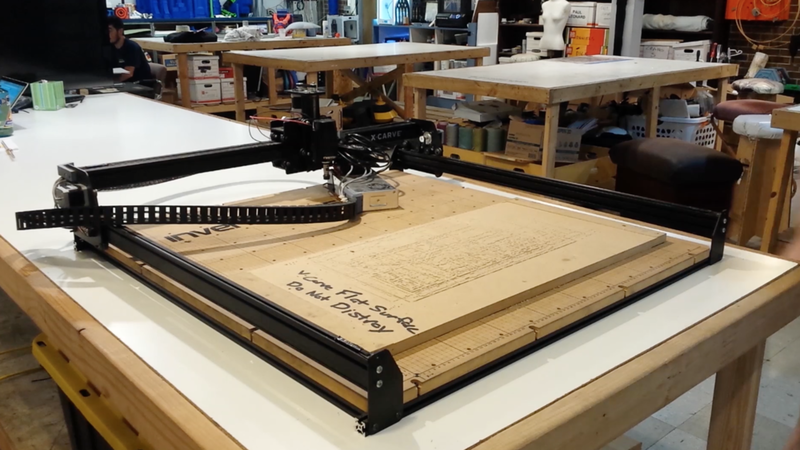 The X-Carve is an inexpensive tabletop CNC carver intended for enthusiast and light duty work. It's working area is 3.2 feet x 3.2 feet x 2.75". The X-Carve has its quirks, but i've had good luck running 3 dimensional G-Code exported from Fusion 360 on it. Like The Beast, this machine is intended to be a 2.5D carver, but with a few advantages. This is my personal machine, so I can freely make modifications to it, and the X-Carve is open source, so all the files and drawings for it are available on Inventables GrabCAD page. For the first stage of the Modifications to this machine, I'm going to add more z-clearance between the bottom of the X-Carve's gantry and its spoil board. The new X-Carve Brackets add 3 inches to the Z-Height of the gantry. A Big Thanks to Tom Newell of Sainsmart and Oni Technologies for doing the cutting for me! Cutting plate aluminum is still a bit out of my wheelhouse. To tell the story of installing this modification, I've made a short youtube video to take you through the steps. Until next time, when we'll adjust the reach of the Z-Axis to take advantage of all that newly added depth. 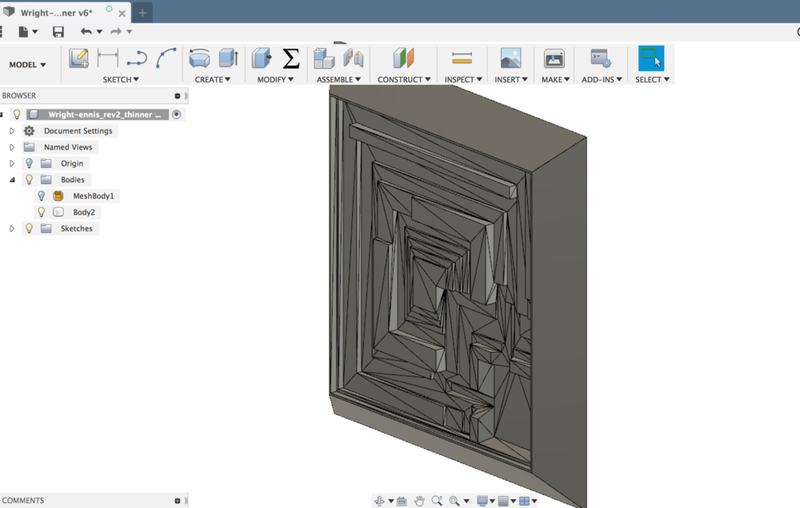 Long ago, there was a simple plugin for SketchUp that would make Involute Gears quickly and easily. Called 'gear.3.rb' I used it on countless simple mechanical projects. Recently I wanted to revisit one of those projects, and found that the original download site for the plugin was gone. So I dug the script out of one of my old SketchUp installs and discovered that it won't load into SketchUp 2015. It looks like there is an error in how the plugin adds itself to the menu system. After adding the script to my sketchup plugins folder, it failed to load do to a missing 'GetString' Method in the script. A quick search of the SketchUp Ruby resources led me to the documentation of the Menu Class. It looks like the class was simplified at some point, and this plugin never got rewritten to use the new tools. The Fix to get gear.3.rb working again seemed straightforward. Rework the UI.menu items in the plugin's Ruby script to match the strucure of the updated commands. To keep things simple, i'm just going to add the two commands from the Involute Gear plugin to SketchUp 2015's 'Tools' menu, and add a menu separator to make them easier to find. Based on the Ruby documentation, the changes were straightforward. 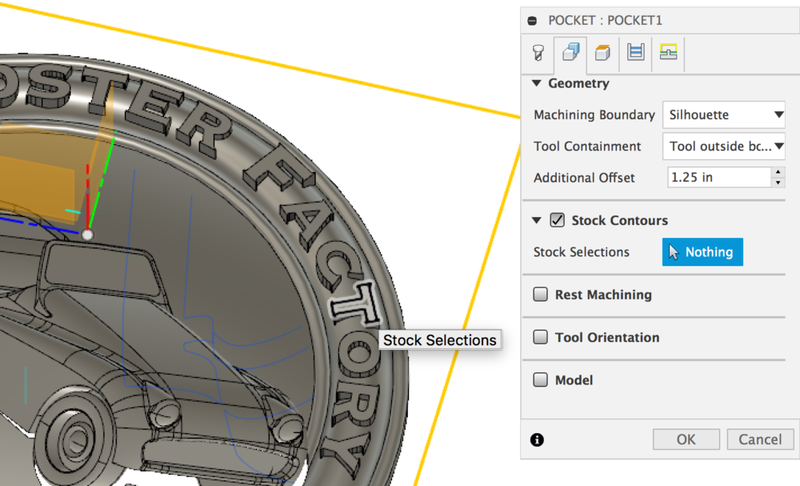 The Two commands from the gears.s.rb script added to SketchUp 2015's Tools menu, with there own menu separator. Did I mention I have never written or modified a Ruby script before in my life? You can download the repaired SketchUp Involute Gear Plugin gears.3a.rb here. You'll need to follow these instructions to get it installed. A big thanks to Doug Herrmann, the original author of this plugin. I don't know where he is now or why his site is gone, but I'm happy I've found a way to keep the tool he created running. Sunday Night at Hammerspace, We cast an Aluminum part from 3D Printed PLA original. While it didn't go 100% as planned, I'm excited to try the process again in the future on other parts! A Big Thanks to Dave Dalton and Hammerspace for helping me make this happen! I have always loved Thingiverse User Dharroun's Dune Queen. For this week's Finishing Friday, We are going to print, paint, and polish it to its full Giger-esque glory. Thingiverse User JonSimmons created this fun new derivative of my original Blank Minifig by combining and reworking parts from several other Thingiverse models. If you would like to print your own Giant Chewbacca, download the files from Jon's Thingiverse derivative page here. This Week we're to look and a 3D Fabrication technology that is a little outside of my wheelhouse. 3D Milling. We'll be using Fusion 360 to generate 3D Toolpaths and carving them from pink insulation foam on my Inventables X-Carve. It's going to be an adventure! Epic 100nM layer Height Print of My Gothic Cathedral Model! Thingiverse User underst0rm just posted this 'I made one' that blows my mind! It's photo of a printed copy of my Gothic Cathedral Playset under and electron microscope! Those little squares in the background are only 2um long. This is without a doubt the coolest 'i made one' i've gotten yet. underst0rm describes his printer as a 'Selfbuilt 2PP machine' or a two-photon lithography system, with a resolution of 0.3 micrometer and a layer height of 100nm. I'd love the learn more about his machine and what it's designed to do. Correction: an early version of this post talked about 100um layer height. That was an error I attribute it to a totally blown mind. The correct units are 100nm - nanometers, not 100um - micrometers. This week we’re adding a generator to my old 3D Printed Wind Turbine. Which method will work better? A DIY built Alternator, or a repurposed 3D Printer Stepper Motor? For two years a 3D Printed axial wind turbine has been happily freewheeling on the fence outside Hammerspace. We call it our Whirlygig, and the constant Missouri wind really gets it going. Now it’s time to turn our whirlygig into a source of electrical power! This Steampunk Inspired Battery Jar has the space and voltage available to run my reproduction of an 1880's electric motor patent model. While hunting through boxes recently, I stumbled across my original 1994 vintage Simcity 2000 3.5in floppy disks. Today, we will build a unique force perspective shadow box to display them. The stock of the Pulse Rifle is, at its core, a piece of metal u-channel with a slot pattern cut into it. The stock extends forward under the rifle's body work and it's mounted to the top of the Thompson's upper receiver. It took me a little while to realize the slots in the stock are not purely ornamental. The slots on the top are close to lining up with the holes where the Thompsons rear sight use to be attached. Our Stock will be designed to be bolted to the Thompson through these holes. Reference model on the left. Measured model of the back of the Thompson on the right. To verify my measurements of the Thompson, I printed the test objects I created in the last step and fitted them onto the gun's body. I had to modify the 3d model a bit and reprint a few times to get the fit I wanted. It was time well spent, now I know my 3d model is accurate and how much allowance I need to incorporate between the Thompson and the final printed parts. I doubled the thickness of the stock's walls in comparison to what's in the reference model. The extra thickness will add strength to the stock and make it less brittle, a critical improvement for a part 3d printed out of PLA. The cutout in the right front of the stock lets the Thompson's charging lever move freely. The inside of the stock, the part that touches the Thompson, is shaped to match the geometry of the test piece I printed earlier, so I know it will fit in place properly. The final part is a 278mm long and will barely fit onto the 285mm x 153mm build area of my MakerBot Replicator 2. To add strength to the finished part I set it to print with 4 outer shells and 50% infill. I also turned the stock to print at a slight diagonal, so that the layer lines on the flat surfaces wouldn't be running parallel to the direction of force. The final printed stock fits marvelously. Its not so tight that its deforming the plastic of the Thompson, but there is good surface contact on all sides. Ther charging lever can move freely into the slot without any problems and the higher print density made the part really strong. For now, i just used two bolts to hold the stock in place. They pass through the slots, through the sight mounting holes, and into the upper receiver where nuts hold them in place. There are many advantages to this over just glueing the stock on. I can adjust its location, remove it for sanding and painting, and easily replace the stock if it gets broken. Next up, The hard part, building the primary body components!